RED WHITE AND BLUE CAMDEM'S RICKSBURY 4 YOU. Buddy loves to play, and just has the sweetest personality. He is a very loving dog, with the best temperament. He looks exactly like his grandfather Lymre Royal Reflection of Ricksbury. 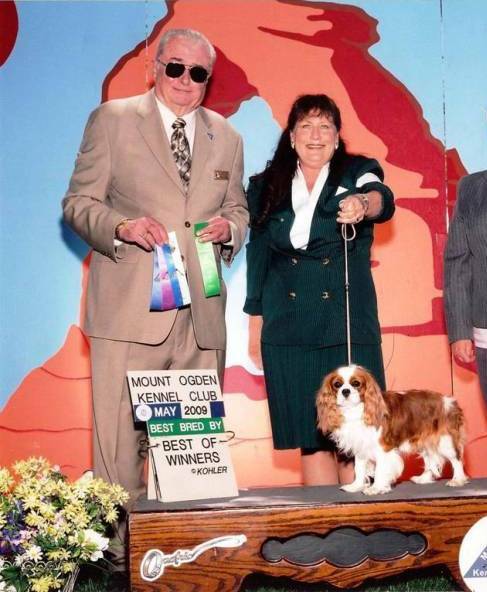 We have had lots of fun showing in AKC shows, and he always has the best time. Buddy's Sire is CH. Camdem's Where Did We Go Right and his Dam is Blossom Princess Of The West. We are excited to show Buddy this spring in the AKC Bred By Group. Buddy won Best of winners in the Bred By and went on to finish 3rd in Group in May 2010. Buddy won Best bred by and went on to take 4th in AKC Best Bred By Group. Buddy Won Winners Dog in Denver Co. February 21st. It was a nice 4 point Major. 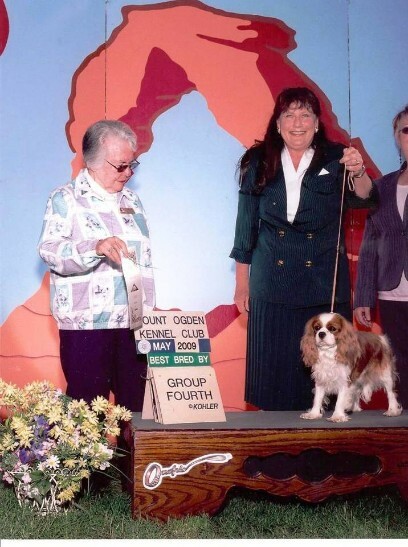 Buddy won a 4 point Major in Denver, he also won Best Bred By. We love all of our Cavaliers, and are extremely proud of all their accomplishments. Whether it be for a small win or a Major win we will always be proud of each and every one of our Cavaliers. Buddy only needed 1 more point to finish his AKC Championship when he broke his front tooth now his showing days are over and he has retired. Buddy will always be a winner to Showdown Cavaliers. A King Charles Cavalier Spaniel is like a potato chip you can't have just one.